• We are inviting a new canine friend to join our Clara Classic Collection, Horatio Husky Buddy! Horatio Husky Buddy! He’s a cool-lookin’ dude with a timber wolf-like appearance …but with this guy, you won’t have to worry about house training. The average size husky is 24’ tall and weighs up to 27 kg. Not exactly a lap dog! This is why we’ve introduced a travel-sized counterpart, Horatio. 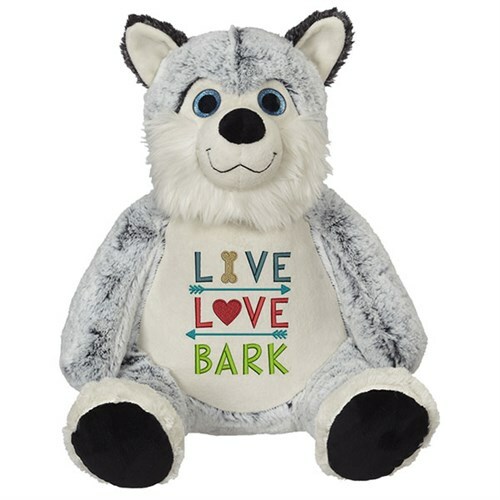 Horatio Husky Buddy stands small but tall at 16” and is feather-light to follow you on all of your adventures. He makes for the perfect companion to keep by your side without the extra weight of kibble. Horatio Buddy is one of our friendliest looking Buddies with his bright blue eyes and soft kind smile. His fuzzy neck and cozy grey and white fur make him the ‘pawfect’ cuddle Buddy. Better yet, while his life-sized brothers are notorious for their shedding coats, Horatio doesn’t need his fur to be cleaned up! Just like the rest of our Buddies, this husky Buddy can easily be unzipped on his backside to access his removable pods for easy embroidery. Horatio’s white chest makes for an excellent space to be adventurous with colourful designs.